A simple Vue 2.0 demo in which there is a little selection of diner food which you can order, and then deliver the order, while watching how data is changing and some nice animations too. This is a fresh project from Benjamin Listwon, to demonstrate some of the new functionalities and show off a couple patterns. 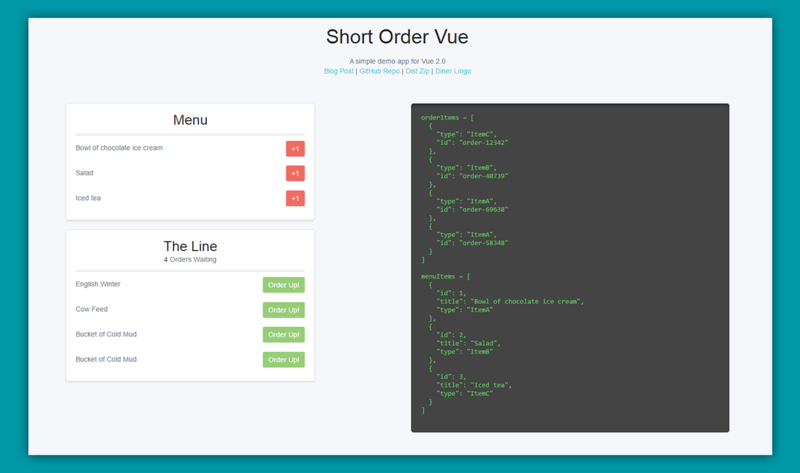 Vuex helper functions are being used as well as *.vue files. The author says that his plan is to keep adding to this app and write more specific stuff about Vue 2.0. Check the demo, blog post and documentation.